Fig. 1. Comparison of an acidification condition experiment and the growth weight of foraminifera. Fig. 2.Schematic diagram of ocean acidification and the buffering system in the Earth’s surface system. The CO2 concentration of air has increased over the last two centuries and recently surpassed 400 ppm. Carbon cycle models project CO2 concentrations of 720 to 1000 ppm for the IPCC intermediate scenario (RCP 6.0), resulting in an increase in global mean temperature of ~ 2.6 °C and a decrease in seawater pH of ~ 0.3. Together, global warming and ocean acidification are often referred to as the “evil twins” of climate change, potentially inducing severe threats in the near future. 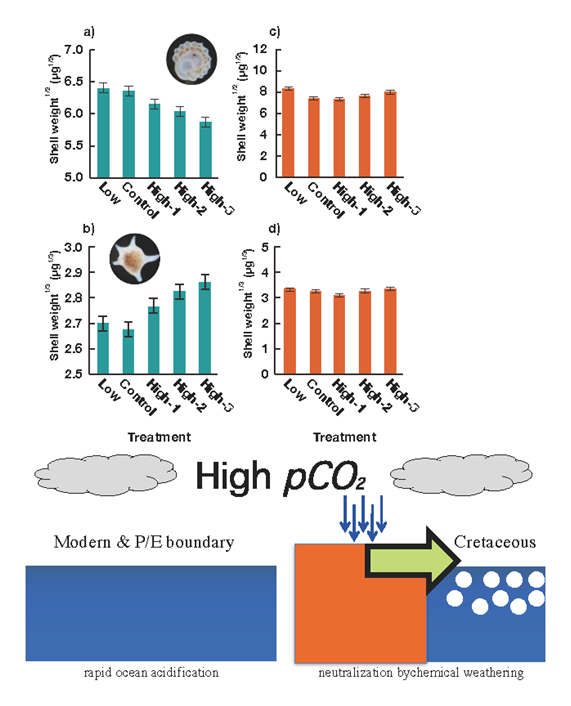 In this paper, our discussion is focused on the response of two major calcifiers, foraminifera and corals, which contribute much to the global carbonate burial rate. Photosymbiosis is regarded as an adaptive ecology for living in warm and oligotrophic oceans, especially for reef-building corals and larger reef-dwelling benthic foraminifera. As a consequence of global warming, bleaching may be a global threat to algal symbiont-bearing marine calcifying organisms under conditions of high temperature and light intensity. 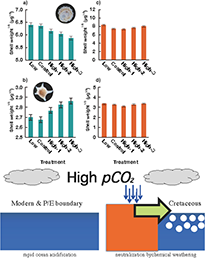 If CO2 is dissolved in seawater, the partial pressure of CO2 in seawater (pCO2) and dissolved inorganic carbon (DIC) increases while pH and the saturation state of carbonate minerals decreases without any change in total alkalinity. Generally, marine calcifying organisms show decreases in calcification rates in response to acidified seawater. However, the response often differs depending on situations, species, and life-cycle stage. Some benthic foraminifera showed a positive response to low pH conditions. The Acropora digitifera coral calcification of adult branches was not reduced markedly at higher pCO2 conditions, although calcification tended to decrease versus pCO2 in both aposymbiotic and symbiotic polyps. New analytical technologies help identify important constraints on calcification processes. Based upon Ca isotopes, the transport path of Ca2+ and the degree of its activity would predominantly control the carbonate precipitation rate. Visualization of the extracellular pH distribution shows that proton pumping produces the high internal pH and large internal–external pH gap in association with foraminiferal calcification. From the perspective of a long-term change in the Earth’s surface environment, foraminifera seem to be more adaptive and robust than corals in coping with ocean warming and acidification but it is necessary to further understand the mechanisms underlying variations in sensitivity to heat stress and acidified seawater for future prediction. Since CO2 is more soluble in lower temperature seawater, ocean acidification is more critical in the polar and high-latitude regions. Additionally, older deep-water has enhanced acidity owing to the addition of CO2 from the degradation of organic matter via a synergistic effect with high pressure. With current ocean acidification, pH and the saturation state of carbonate minerals are decreasing without any change in total alkalinity. However, in the Earth’s history, it is well known that alkalinity has fluctuated significantly. Therefore, it is necessary to quantitatively reconstruct alkalinity, which is another key factor determining the saturation state of carbonate minerals. The rapid release of anthropogenic CO2 (in the present day and at the Paleocene/Eocene boundary) induces severe ocean acidification, whereas in the Cretaceous, slow environmental change, even at high levels of pCO2, could raise alkalinity, thereby neutralizing ocean acidification.